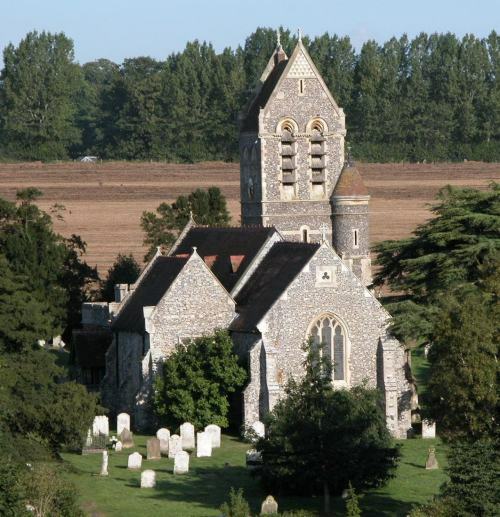 The Church of St. Peter and St. Paul is in the village of Ospringe, whose main street forms part of the A2 (Roman Watling Street) just south of Faversham town centre. The parish church, big and imposing, reflects this. Though rather placed on the fringe of the built-up area, it looks more like a town church than a village one. But it's site is no accident: a spring used to rise beside the Victorian bier-house on the opposite of Water Lane. Ospringe church dates from early Norman times and has two Norman doorways and 13th century arches; the tower is modern. The massive font is also Norman. See "History" below for further historical information. The church have a fine two-manual organ built in 1870 by Bevington and added to by Walker in 1900. It is regularly maintained and used for most services. For more information and details about events at our church, please visit our website at: www.dochurch.org.uk. We welcome requests for baptisms, weddings and other services. The churchyard is a popular place for a quiet sit-down, or for a peaceful walk. We welcome both children and adults! there are always activities and things to do for our children and we enjoy involving them in each of our services. As precious sources of fresh water springs were sacred in pagan times and churches were often built near them so they could lend a bit of lustre to the new, and rather more sophisticated, creed of Christianity. So, there was probably a church here in Saxon times. If so, it was probably a wooden building and all traces have now gone. Like so many others, it made way for a stone-built structure in Norman times. This soon became too small for local needs and the church had to be extended in the 13th century, but a single Norman doorway survives in the north chancel wall, and you will notice this on your left as you walk up the path to the north porch. In size the church has hardly grown since the 13th century, but in fact was once bigger - there was a detached Lady Chapel in the churchyard, to the east of the chancel. What a pity this uncommon feature hasn't survived! If you want to get an idea of how it might have related to the main building visit Higham Ferrers in Northamptonshire where such a chapel remains. The most conspicuous feature from a distance is the distinctive saddleback tower. If this were a medieval survival it would be very rare, because saddlebacks are commonest in Germany and hardly ever seen here. In fact, however, it is the most modern part of the church, put up in 1866 by the architect, E.L.Blackburne as the culmination of this restoration work. Was there a tower before this? Yes, there was a round one - very unusual outside the eastern counties - but it collapsed in 1695 while the bells were being rung as a loyal tribute to William III, who was passing through Ospringe Street (the A2) at the time. Miraculously, no-one was killed or even injured. A replacement was quickly built, but not very well and had to be pulled down after 53 years. The bells were sold for £61.16.2d and a little bell-cote installed over the roof at the west end. So for 115 years there wasn't a tower and the church rather lacked presence as a result. The present robust structure, a registered bat roost, makes full amends and house a ring of eight bells which can also be played as carillon. As you go through the porch, note there is a rather good fake-Norman doorway. The early English arcades lead the eye to the chancel where there is a fine altar rail and colourful mosaics, all installed in Victorian times. Indeed the interior has a strong Victorian flavour, so thorough was architect Blackburne's restoration. Harsh, same people might say, but picture the building as it was when he started in 1858 - damp, musty, neglected and with a rickety collection of wooden galleries which might have given the impression you were on board ship, rather than in the church. In many churches after the reformation, side-chapels became the responsibility of important local families who buried, or at least commemorated their dead there. So, here in Ospringe, the South Chapel, at the end of the South aisle, was looked after by the Harts. Often, too, because they were privately owned, these family chapels escaped heavy-handed Victorian restoration, and so it is here. Monuments, as ever in our parish churches, are worth more than a cursory glance. Study them carefully, and you will understand our heritage better. Two especially fine examples here are those commemorating James Master, who died in 1631 and Robert Streynham, the first Earl of Pembroke, who died in 1631. Both surnames were once very common in the Faversham area, Master something appearing as Masters and Streynham as Stranham, Transom or even Trentcham. Cast an eye around the attractive churchyard before you leave. Among those buried here you will find members of the Hall family and others involved in the Faversham gunpowder industry.